Naples Park begins on the east at US 41 (Tamiami Trail) and extends west toward the Gulf of Mexico, culminating at Vanderbilt Drive. Immokalee Road (111th Avenue North) is the northern boundary. The community stretches south to 91st Avenue North just north of Vanderbilt Beach Road. On the other side of Tamiami, you'll find Strada Place, home of one of Naples’ newest, upscale multi-use districts, the Mercato. With everything from eateries and boutiques to a Whole Foods Market, this pedestrian friendly “Main Street” is quickly becoming one of Naples’ must-see sites. Naples Park was originally developed as a community of winter homes for snowbirds escaping the harsh winters of the Great Lakes and New England states and Canada. Over the years, it transformed into an ideal community for retirees and young families. It is the Florida represented on so many of those old, familiar “Wish you were here” Florida postcards. Naples Park Homes For Sale - Updated Every 15 Minutes! Nearby Vanderbilt Beach is the perfect spot to spend a warm Southwest Florida day, a morning jog, an evening stroll or to relax and marvel at one of the incomparable sunsets over the Gulf of Mexico created especially for Naples residents to enjoy. A 340-car parking garage makes visits to the beach even more convenient for a visit. Just the other side of 91st Avenue is the Pavilion Shopping Center and the noted Fleming’s Prime Steakhouse & Wine Bar. The Gulf Coast beaches are minutes from anywhere in the Naples Park. Beach access is available at multiple deeded access points along Gulf Shore Drive on the west side of Vanderbilt Channel. An unincorporated census-designated place (CDP), Naples Park is home to 3,145 residential units, including single-family homes, duplexes, and condominiums. With a 2010 census population of less than 6,000, there are, on average, about two persons per residence. The age demographic is surprisingly similar across all census age groups, enhancing the family-friendliness of Naples Park. There are no homeowner’s associations and, therefore, no deed restrictions or dues. As one would expect with a community original developed in the mid-20th century, lot sizes are uniform with 50-foot frontages and are 135-feet deep – about 0.15 acres. 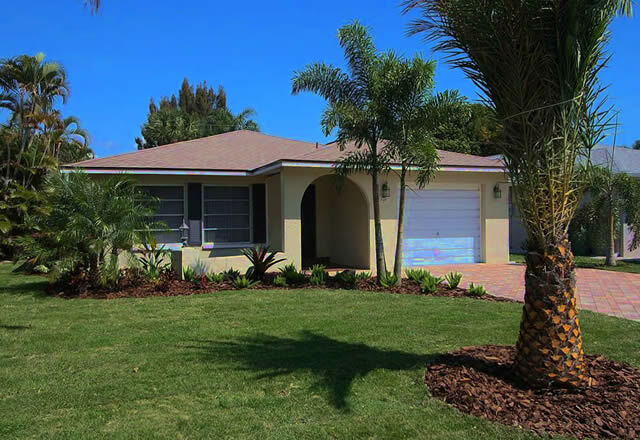 Unique for communities west of US 41, Naples Park is in demand by students, retirees, snowbirds, and investors. Parents of young children are always pleased to learn of Naples Park Elementary School, whose name itself hints at its convenient location on 111th Avenue North. The student population of the school is 531 with a student/teacher ratio of about 17.5 to one. High school students attend Barron Collier High School, which is about three miles south on Pine Ridge Road. BCHS participates in the Cambridge International advanced learning program under the auspices of the renowned Cambridge University in Cambridge, England. Students may receive up to 45 hours of college credit and received advanced standing at many universities. The Cougars have fielded state champions in tennis, girls’ basketball, and wrestling, and district champions in football and basketball. BCHS has a student population of nearly 1,700 with a student/teacher ratio of 18.9-to-one. Pine Ridge Middle School has just over a thousand students in grades four through eight. “Pine Ridge Middle School is dedicated to providing a safe, supportive environment in which our educational community will be challenged to develop its visions of the future and to realize its highest potential” (BCHS Mission Statement). Welcome to Naples Park, where your neighbors are your friends, and you other friends wish they were your neighbors.